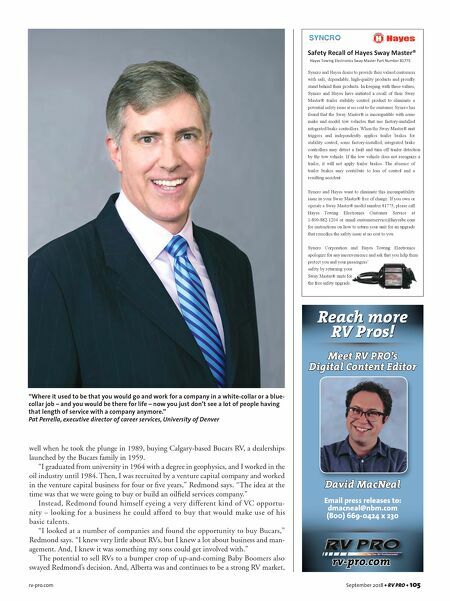 rv-pro.com September 2018 • RV PRO • 105 well when he took the plunge in 1989, buying Calgary-based Bucars RV, a dealerships launched by the Bucars family in 1959. "I graduated from university in 1964 with a degree in geophysics, and I worked in the oil industry until 1984. Then, I was recruited by a venture capital company and worked in the venture capital business for four or five years," Redmond says. "The idea at the time was that we were going to buy or build an oilfield services company." Instead, Redmond found himself eyeing a very different kind of VC opportu- nity – looking for a business he could afford to buy that would make use of his basic talents. "I looked at a number of companies and found the opportunity to buy Bucars," Redmond says. 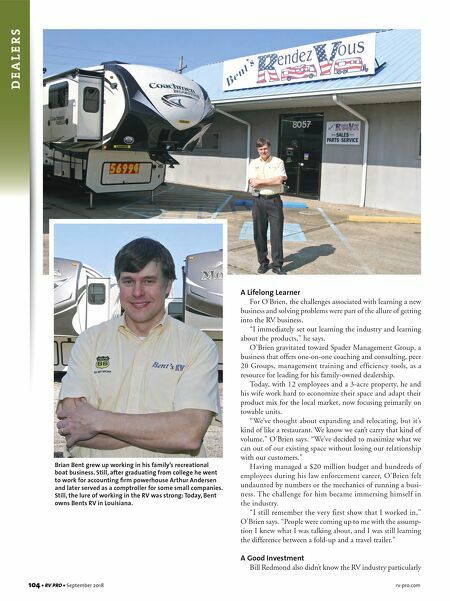 "I knew very little about RVs, but I knew a lot about business and man- agement. And, I knew it was something my sons could get involved with." The potential to sell RVs to a bumper crop of up-and-coming Baby Boomers also swayed Redmond's decision. And, Alberta was and continues to be a strong RV market, "Where it used to be that you would go and work for a company in a white-collar or a blue- collar job – and you would be there for life – now you just don't see a lot of people having that length of service with a company anymore." Pat Perrella, executive director of career services, University of Denver Reach more RV Pros! Meet RV PRO's Digital Content Editor David MacNeal rv-pro.com Email press releases to: dmacneal@nbm.com (800) 669-0424 x 230 Safety Recall of Hayes Sway Master® Hayes Towing Electronics Sway Master Part Number 81775 Syncro and Hayes desire to provide their valued customers with safe, dependable, high-quality products and proudly stand behind their products. In keeping with these values, Syncro and Hayes have initiated a recall of their Sway Master® trailer stability control product to eliminate a potential safety issue at no cost to the customer. Syncro has found that the Sway Master® is incompatible with some make and model tow vehicles that use factory-installed integrated brake controllers. When the Sway Master® unit triggers and independently applies trailer brakes for stability control, some factory-installed, integrated brake controllers may detect a fault and turn off trailer detection by the tow vehicle. If the tow vehicle does not recognize a trailer, it will not apply trailer brakes. The absence of trailer brakes may contribute to loss of control and a resulting accident. Syncro and Hayes want to eliminate this incompatibility issue in your Sway Master® free of charge. If you own or operate a Sway Master® model number 81775, please call Hayes Towing Electronics Customer Service at 1-800-882-1204 or email customerservice@hayesbc.com for instructions on how to return your unit for an upgrade that remedies the safety issue at no cost to you. Syncro Corporation and Hayes Towing Electronics apologize for any inconvenience and ask that you help them protect you and your passengers' safety by returning your Sway Master® units for the free safety upgrade.